When I saw the Changing Faces Practitioner role at Salisbury District Hospital advertised on NHS Jobs, I was enthusiastic to find out more. I was aware of the amazing work that Changing Faces, a registered charity, do to support people with visible differences along with other charities, such as the Katie Piper Foundation. More than a million people in the UK have conditions, scars or marks that affect their face or body. Changing Faces is the leading UK charity supporting and representing these individuals and their families (Partridge, 1990; and tinyurl.com/pvelqhv). The Changing Faces Practitioner (CFP) role was developed to provide psychosocial support to children, adults and families struggling with appearance concern as a result of having a ‘visible difference’. The practitioners base the foundation of their work on a psychosocial model developed by Changing Faces from previous academic and clinical research (Rumsey & Harcourt, 2004; Rumsey & Harcourt, 2012). The FACES package stands for Finding out, Attitude building, Coping with feelings, Exchanging and Social skills. It incorporates the use of cognitive behavioural therapy (CBT) and social interaction skills training (SIST) to help improve mood, self-esteem and confidence but additionally to manage social situations and the reactions of other people. Historically the current site of Salisbury District Hospital was called Odstock Hospital. Built by the US Army in 1942 as a centre for dealing with wounded servicemen from the D-Day landings, it was transferred to Salisbury Health Authority after the war, and became renowned for its pioneering work in plastic surgery and burns rehabilitation. Today the hospital has a large Maxillofacial and Plastic Surgery Department, Burns Unit, Laser Centre and Dermatology Department as well as many other services that patients with visible differences might access. Therefore, it is an apt setting for a new CFP role and it was the lead consultant in maxillofacial surgery that recognised there was a need for psychological support for these patients. I did experience some initial trepidation about establishing a CFP role amongst services that had never had access to psychology before. My concerns were unfounded as everyone was extremely welcoming and positive about the benefits the role may have for their services. There are now eight other CFP roles in place across the UK, three of which are in NHS settings. Each practitioner has come from a different background (e.g. nursing, social work) and employs the skills they have acquired to form their own unique way of working. We all meet for supervision and continuing professional development sessions in varying geographical locations, this time together proving invaluable and allowing us to lend our different experiences to learn and develop as practitioners. My background is in CBT, having worked previously in the local IAPT service. I had also worked as an Assistant Psychologist at Salisbury District Hospital so had some experience of working within a physical health setting. 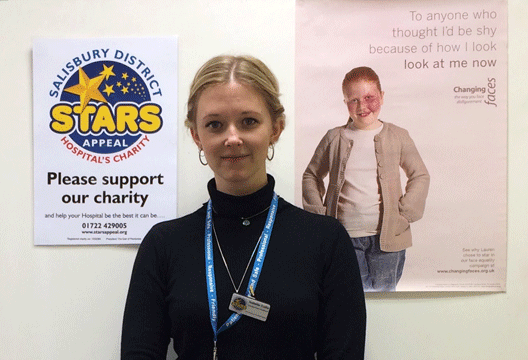 The position in Salisbury is funded for three years, partly by the Stars Appeal (the hospital’s main charity) and partly by Changing Faces. Some of my new colleagues had ideas of how the position might work within the hospital, but I was given a huge amount of autonomy in shaping and moulding the role in a way that I felt would suit the services and patients who access them. This I found to be hugely exciting but also daunting. I attribute this to the level of personal responsibility I felt, for the position to be a success and the pressure to ‘prove my worth’ in order to secure further funding (a feeling which I feel may resonate for many psychologists working within the current NHS climate!). More and more positions are being funded by external charities, and it is the clinician’s responsibility to demonstrate their value and need often in a short space of time. Furthermore, this is sometimes with minimal guidance as charities can be new to managing clinical roles and have less experience of working within hospital environments. My first few weeks in the role was spent visiting departments, attending clinics, multidisciplinary team meetings and trying to advertise the role as much as I could. I also had to research many and various medical conditions, procedures and treatments as I was regularly overwhelmed and completely lost in medical jargon used in these settings: this highlights an important issue for patients too, who may have the same feeling when attending appointments and perhaps don’t always voice this. I e-mailed local services and made links with other psychologists who work in a similar field and organised to visit the Centre of Appearance Research in Bristol, where much of the evidence base I work from was pioneered. My post was helped by being embedded amongst a team of clinical psychologists providing a service to all wards and departments within the hospital. The department has been long established within the hospital, and the clinicians are well thought of and valued: this has eased the integration of my post into the different departments of the trust. It has also added an additional level of support, supervision and encouragement in the setting up and development of my post. I have had the opportunity for a broader range of experiences such as teaching trainee clinical psychologists. I needed to develop a referral pathway, which has taken some trialling and modification so it is most effective and easily accessible for staff patients. Generating referrals has sometimes been difficult. The research suggests that this may be due to the prioritising of trauma, physical recovery and functional repair in healthcare settings. Disfigurement can be deemed a ‘luxury’ problem (Konradsen et al., 2009). Furthermore, the enormous time constraints that are placed upon consultants and staff in the NHS can mean that the opportunity of recognising the signs of distress can be missed, particularly if patients are not aware that they can access psychological support, or are not forthcoming about how they are feeling. One of the solutions I have found to this difficulty is having a physical presence within clinics and MDT meetings. This can help prompt referrals but can also prove challenging in itself, given commitments and capacity. Similarly, working in a vast multidisciplinary team often means liaising with healthcare professionals who work within the medical model. I have had to be quite assertive in ensuring my opinion is heard, but equally tried hard to hear the advice and opinions of others. The array of visible differences that referred patients have ranges from stretch marks to facial prostheses following treatment for head and neck cancer. Certainly these cases echo the current findings that severity does not predict likelihood of coping (Moss, 2005), but the variety of work has been rewarding and stimulating. Additionally this has contributed to my learning experience as many patients have physical health problems associated with their difference (e.g pain, fatigue) that can influence their ability to do day-to-day tasks, which then has a major impact on their mood. One of the biggest challenges I have encountered has been working with patients who have been refused funding by their Clinical Commissioning Group to have certain procedures, often because they deem them to be purely cosmetic. These patients understandably attribute their distress to their visible difference and feel the only viable solution to improving their mood is to have the procedure that is being denied them. Similarly patients can have unrealistic expectations of plastic surgery and what modern-day medicine can achieve; helping staff to manage that expectation and the emotional repercussions when it has not been met has been interesting. I feel the media has a lot of answer for here in building these expectations; day in, day out we are bombarded by adverts on billboards and bus stops displaying the ‘euphoria’ that you too could experience if you were to undergo (risky) surgery! I have been in post now for 12 months and I can’t quite believe how quickly those months have flown by. Looking back, I have had some really interesting and amazing opportunities during this short time. I have been able to develop my clinical skills further in assessment, formulation and implementation of CBT, SIST and often drawing from acceptance and commitment therapy (ACT), an approach that has proved to be beneficial for these patients. There’s a growing evidence base for the effectiveness of third-wave approaches in clinical and health psychology settings (Pull, 2009) and in particular with patients who have long-term health conditions. I have been asked to give various presentations and teaching sessions across the hospital and also at the Centre of Appearance Research in Bristol. There has also been a large emphasis on researching this area further and evaluating the FACES package. My aim for the next few months is to continue to develop the one-to-one aspect of the role whilst also setting up support sessions and SIST workshops for patients to access. I also hope to contribute towards the evidence base of using ACT with individuals who have a visible difference. The role has required me to work in a broad and flexible way, often being creative and employing new techniques in areas that are novel to me, such as marketing and consulting. I have also had the opportunity to provide supervision to psychology volunteers and honorary assistants ,which has been a great experience and one that I look forward to continuing throughout my career in psychology. Konradsen, H., Kirkevold, M. & Zoffmann, V. (2009). Surgical facial cancer treatment: The silencing of disfigurement in nurse–patient interactions. Journal of Advanced Nursing, 65(11), 2409–2418. Moss, T.P. (2005). The relationships between objective and subjective ratings of disfigurement severity, and psychological adjustment. Body image, 2(2), 151–159. Partridge, J. (1990). Changing faces: The challenge of facial disfigurement. London: Penguin. Pull, C.B. (2009). Current empirical status of acceptance and commitment therapy. Current Opinion in Psychiatry, 22(1), 55–60. Rumsey, N. & Harcourt, D. (2004). Body image and disfigurement: Issues and interventions. Body Image, 1(1), 83–97. Rumsey, N. & Harcourt, D. (2012). Oxford handbook of the psychology of appearance. Oxford: Oxford University Press.